It’s easy to get caught up in the day-to-dayness of life and not head out with my camera in search of interesting photos, so I like to try to allow myself at least a few minutes every day to consider what I see when I am out and about…even if out and about is about getting to and from work…in an interesting way. And then, it seems, I am also more ready for those shots when I come across something a little more out of the ordinary. After spending the early part of the week in deep conversation with parents and students during parent-student-teacher conferences, I headed off to Washington D.C. for the National Writing Project Annual Meeting. The conference is at the same time every year, but always in a different location. 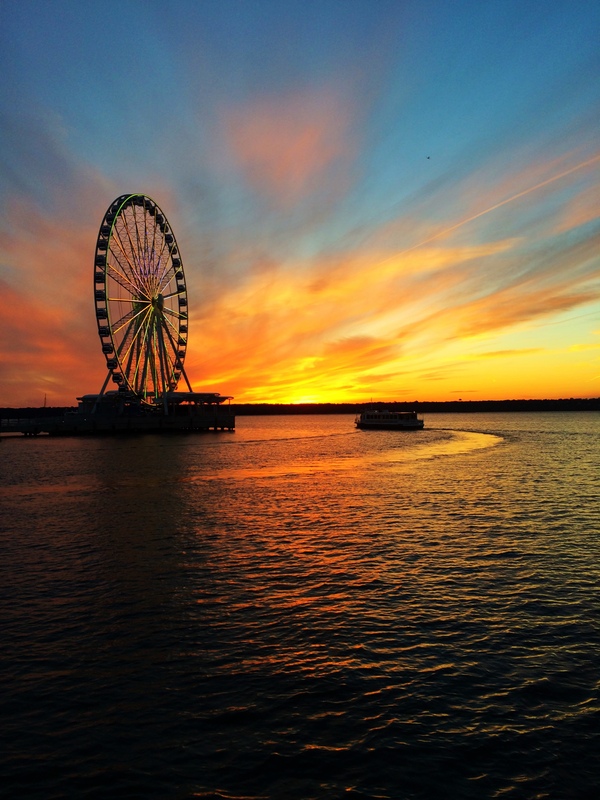 When we arrived at our hotel in National Harbor, Maryland (just across the Potomac from DC), we discovered that our hotel room had a spectacular view of the river…as the sun was setting after a long day of travel. And it’s cold here! Seeing the gorgeous sky, a ferris wheel, and water…my friend and colleague Janis and I looked at each other, pulled on our coats and rushed outside to see if we could get closer, without any rooftop obstructions to take a few pictures before the colors in the sky dissipated. And in spite of freezing fingertips and eyes tearing in the wind…we discovered a little sandy beach sculpture garden…with body parts protruding! And I did snap shot after shot of the sun setting behind the ferris wheel. Here’s one of my favorites! 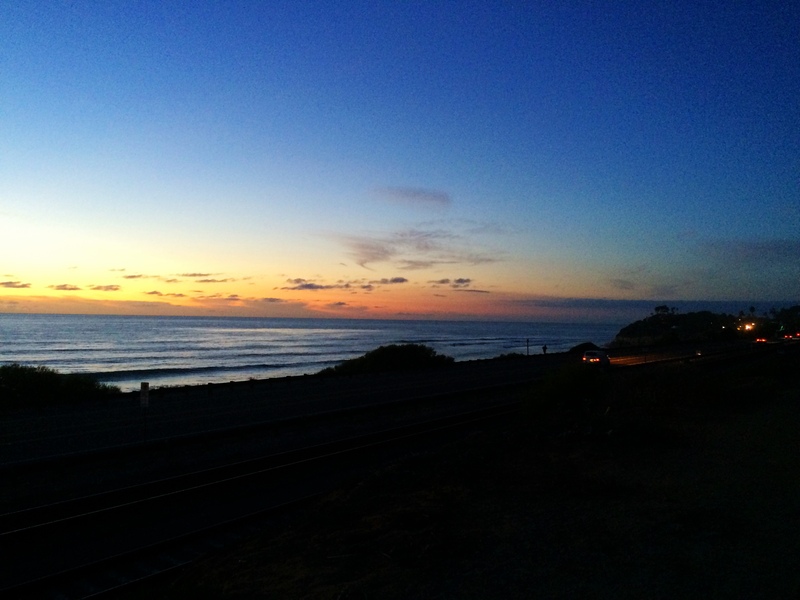 But more typically, I grab my out and about moments in my familiar setting. I took this one the other day after school. As I drove away from the parking lot and headed home I simply pulled off to the side of the road and tried my best to capture the colors in the sky…I think I have newly discovered that the advantage of standard time and shorter daylight hours is that I see more sunsets! And out and about on the weekend, I spent time walking at the lagoon. It’s dry and winter is approaching, so the plants are mostly shades of brown. 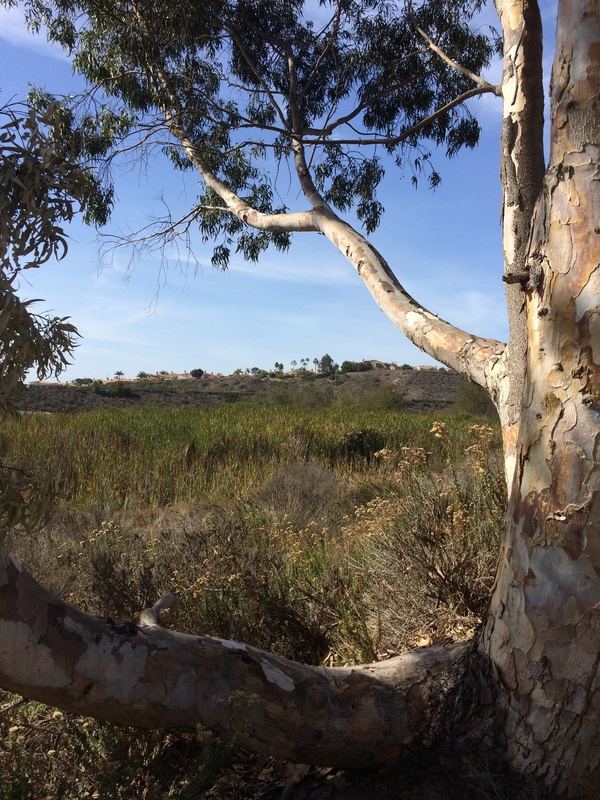 If you look closely you might see the freeway that runs across the lagoon to the west in this shot framed by the eucalyptus tree. And sometimes shots that seem ordinary can become something more by a bit of app magic. 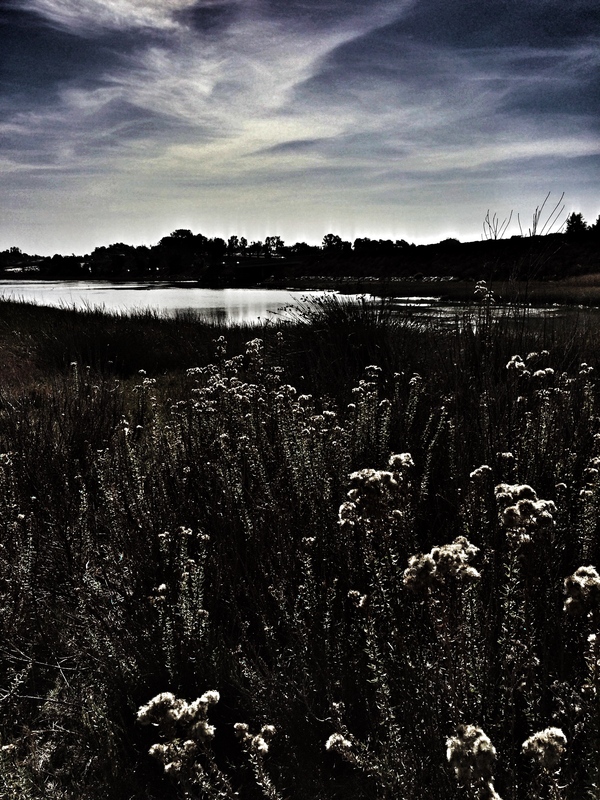 I played around with some filters with this one and my view of the lagoon took on a much more dramatic tone. What do you see when you are out and about? What do you pass every day on your way to and from work, while you watch your child’s soccer (or football or dance…) practice, as you walk the dog or head out for a jog? I share my photography and writing on social media. You can find me on Instagram and Twitter using @kd0602. If you share your photos and writing on social media too, please let me know so I can follow and see what you are doing. To help our Weekly Photo community find each other, use the hashtag #outandabout for this week and include @nwpianthology in your post. Squeeze in some time for a few photos while you are out and about this week. I can’t wait to see what out and about looks like through your lens! 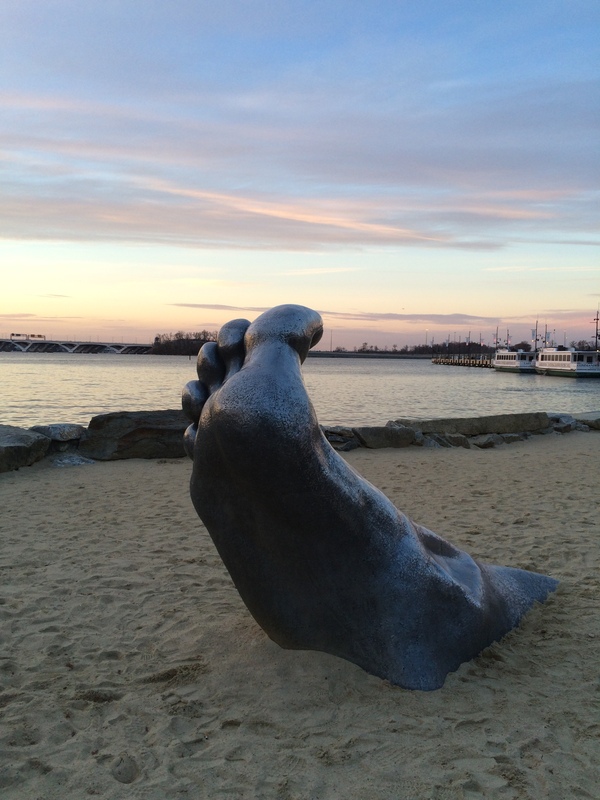 This entry was posted in Weekly Photo Challenge and tagged #nwpam14, iphoneography, national harbor, nwpianthology, out and about, photo essay, writing on November 21, 2014 by kd0602.